A unique experience and a discovery of great wine and food is what you will find when you visit Lancaster’s newest wine lounge. Complexity Wine is conveniently located on the Southwest corner of Avenue J-8 and 20th St. West and has proven to be the place to go for a relaxing and enjoyable evening. I have frequented Complexity Wine quite a few times in the short time they have been open and have thoroughly enjoyed myself each and every time. The first time was with my significant other. We went to sit back, relax and enjoy a glass wine. For me it was Wiens brut rosé sparkling and for him, a Wiens viognier. The current wine list features over 80 different selections from various wineries in California, Washington, Oregon, France, Italy, Spain and New Zealand, so there is a very nice variety to choose from. Mine had notes of strawberry, vanilla and lemon rind — a delicate fruit palate that cascades into a refreshing finish. His, on the other hand, was a full-bodied white wine with delicate floral notes. Both were so delicious, that we partook in another glass and added the wild mushroom flatbread to pair with our wine. It featured Alfredo sauce, a mushroom medley, sun-dried tomatoes, artichoke hearts, mozzarella and parmesan. This is where savory meets sophistication — a mixture of incredible flavors spread on a heavenly slice of flatbread. Its texture is soft and chewy, similar to that of pita bread. Its taste is largely neutral, with just a hint of sweetness. We were both pleasantly satisfied and proceeded to sit back and soak in the ambience of the lounge. My next visit was with a few girlfriends for dinner and what a wonderful dinner we had. We ordered a tableful of exquisite food from a varied and lovely menu. Appetizers, or starters as they are referred to, include very interesting items like marinated mozzarella, steak crostini (just the right light bite to start your dinner), ignited hummus and the wine grenade. Interestingly enough, there were even stuffed dates in three different varieties — the easy, the nutty and the hot date. I did notice that every item on the menu includes which wine pairs best with the item, to help give you the ultimate dining experience. We chose the wine grenade as our appetizer, which featured grilled avocado, topped with burrata, bruschetta, parmesan cheese and balsamic reduction. That was the perfect appetizer, as it captured the flavors of garden ripened tomatoes, fresh basil, garlic, olive oil and then mixes with the creamy, buttery flavors of the burrata cheese and avocado, ending with a slight kick from the balsamic reduction. It was very palate pleasing, indeed. 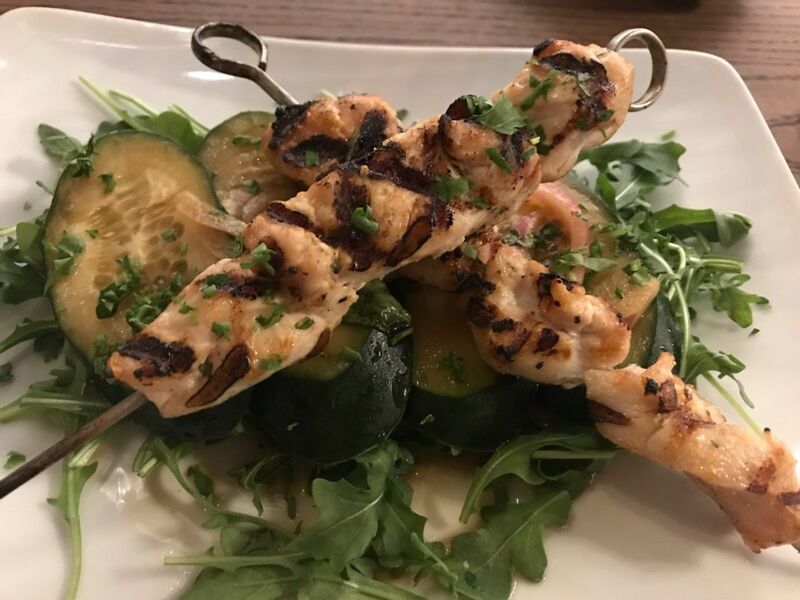 The rest of the menu consisted of caprese salads (California, sweet Gayle, spicy Diane and the patriot); brochettes (steak or chicken skewers), we ordered the grilled chicken with marinated cucumber slices. The chicken was nicely seasoned and very moist and the cucumber slices were refreshing, but I must confess, I didn’t give my friends a chance to try them. I just kept eating slice after slice until they were gone and then I raved and raved about how fabulous they were. The salads were next (mixed greens, chicken Caesar and our choice —spinach — which included fresh spinach, cranberries, gorgonzola, walnuts, aged balsamic and parmesan cheese and as I gathered these flavorful fresh ingredients into each bite, they were like an explosion of yumminess in my mouth—a true delight! Now, on to the paninis, which are served on ciabatta bread with a spicy Thai noodle salad (chicken pesto, roast beef, grilled vegetable, prosciutto, spicy Italian and caprese). We chose the chicken pesto (grilled chicken breast, tomato, mozzarella, cilantro pesto and avocado). This sandwich was a force to be reckoned with because it was a delicious mix of chicken, pesto, veggies and cheese, all melted together on flavorful ciabatta bread. It was simple but very understated with the cilantro putting it right over the top. The Thai noodle salad was served with the panini (rice noodles, fresh veggies and tossed in peanut lime dressing), which can also be ordered as a side dish. All I can say about this salad is, it’s fresh, healthy and delicious with a nice kick at the end and it’s my new favorite salad. The gourmet mac ’n cheese with truffle crust topping followed, with crazy names like the squealer (jalapeño, bacon and jack); down to earth (mushroom, pesto and parmesan); firecracker (chipotle, sun dried tomato, manchego and chorizo crumble and our choice— the tangy garden (marinated tomato, artichoke and white cheddar), which had to be the hit of the night. This was a beautiful bowl of large, perfectly cooked noodles in the creamiest sauce you could ever imagine, chock full of fresh deliciousness and all wrapped up with a nice toasted crumble on top. Last, but certainly not least, was the alpha and omega dessert from a choice of drunk red velvet cake, tiramisu and the Bonnie and Clyde. The dessert came beautifully presented as a chocolate, berry and brie panini with fresh strawberries, blueberries and freshly made whipped cream to dip. A one-word description for this little jewel is elegant. Complexity Wine Lounge offers craft beer from local breweries, plus cheese and charcuterie served with the chef’s selection of fruit, nut and bread. Ask your server for the day’s selection of artisan cheeses and meats. The wine lounger is open daily and located at 2010 W. Ave J-8, 661-577-4141. Check the website for complete menu, hours and events.